VATICAN CITY (CNS) — Christian business leaders have felt the weight of the global economic crisis just like most workers have, but they must hold on to hope, increase their prayers and ask God’s grace so their decisions may benefit as many people as possible, Pope Francis said. “The Christian entrepreneur is urged always to bring the Gospel to bear on the reality in which he works; and the Gospel asks him to put in first place the human person and the common good and to do his part so that there are opportunities for work, for dignified work,” the pope said May 10. Pope Francis addressed his comments to business leaders and experts in Catholic social teaching attending a three-day international conference on “the good society and the future of jobs,” looking particularly at how solidarity can be part of business decisions. 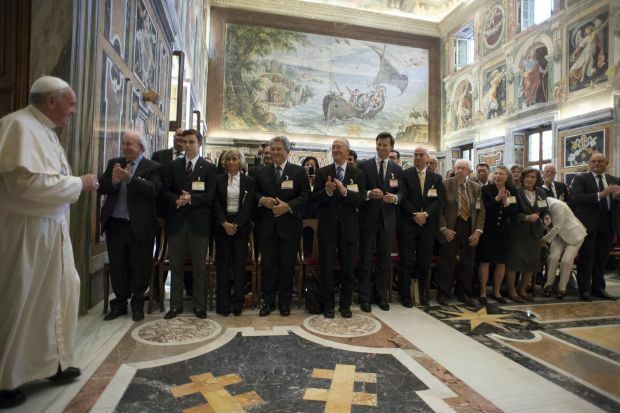 The conference was sponsored by the Centesimus Annus Pro Pontifice Foundation, which seeks to implement the teaching of St. John Paul’s 1991 encyclical on social and economic justice. The global economic crisis, the pope said, has dimmed the hopes of many entrepreneurs, and the church cannot leave them to fend for themselves. Parishes, dioceses and Catholic associations must be places where business leaders, and also politicians, professionals and union leaders, draw guidance and encouragement for moving forward together for the good of all.